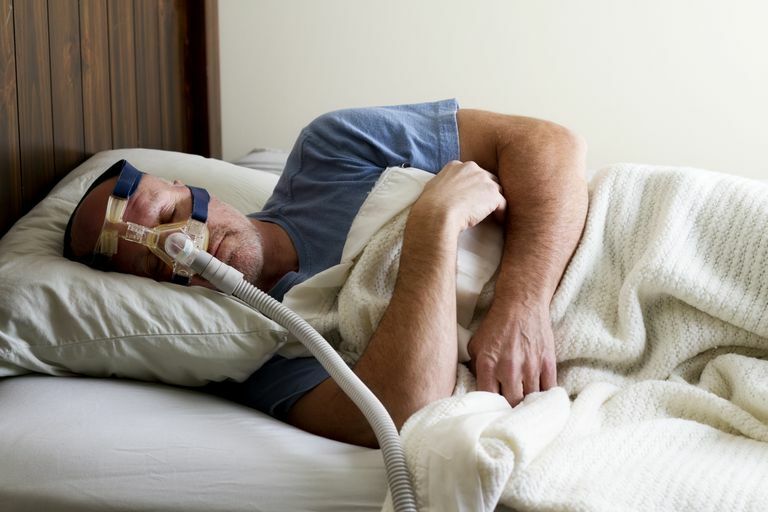 How Does a CPAP Machine Work to Treat Sleep Apnea? If you have been told that you need to use a continuous positive airway pressure (CPAP) machine to treat your sleep apnea, you may wonder how a CPAP machine works. Here, you'll learn how these devices relieve snoring and sleep apnea with pressurized air and what special considerations may be necessary if you have central sleep apnea. CPAP machines have been used for the treatment of sleep apnea since 1981. Dr. Colin Sullivan first recognized the potential benefit of a constant, pressurized airflow created with the motor of his mother’s vacuum cleaner. Sleep apnea had previously required tracheostomy to resolve, bypassing the collapse of the throat. Now, with a fitted mask, tubing, and a machine that could generate air pressure, the disorder resolved. It was a remarkable discovery — and one met with initial skepticism. It would take 5 years before the devices became more widely available commercially. Modern CPAP machines work based on the same principles as the initial devices developed by Dr. Sullivan. The pressures are now generated with smaller, quieter motors. Nevertheless, room air (not oxygen) is taken in through a filter and pressurized according to settings prescribed by your sleep specialist. Machines are set to deliver a pressure from 4 centimeters of water pressure (CWP) up to a maximum of 25 CWP. This air is often passed through a heated humidifier and delivered via tubing to the mask interface. The constant flow of pressurized air creates a cushion along the upper airway. Some have described it as a pneumatic (air) splint that keeps the throat from collapsing. This prevents the soft palate, uvula, and tongue from shifting into the airway. It reduces the vibration that creates the sound of snoring. It may relieve swelling within the nose and clear out mucus from along the airway. By supporting the airway, breathing normalizes and sleep quality improves as fragmented sleep resolves. Oxygen levels can be maintained. The serious consequences of sleep apnea can be averted. AutoCPAP machines vary slightly in that they can detect a collapse of the airway by measuring resistance and react by increasing the pressure as needed during the night to further resolve the sleep apnea. These devices will also test lower pressures and adjust downward if possible. Some inevitably worry about the consequences of seemingly artificial or “unnatural” CPAP therapy. Fortunately, there are surprisingly few side effects. It is important to review the special case of a related condition. Central sleep apnea is defined by pauses in breathing that are characterized by a lack of effort to breathe, rather than a collapse of the airway. It most often occurs secondary to stroke, congestive heart failure (CHF), and narcotic or opioid medication use. It can also occur in response to CPAP therapy itself, in a condition called complex sleep apnea. In central sleep apnea, it is sometimes necessary to consider other therapy modalities. In particular, bilevel therapy is sometimes necessary. Bilevel delivers two pressures, one to breathe in and a lower pressure to breathe out. Bilevel ST may actually kick in timed breaths to compensate for the breathing pauses. This timed mode can inflate the lungs to ensure a minimum number of breaths occur. In addition, a more sophisticated level of treatment called adaptive (or auto) servo-ventilation (ASV) can be used. This allows control of breath rate, volume, the timing of the delivered airflow, and other variables in those who have more significantly compromised breathing. Fortunately, you don’t need to know a lot about how your machine works. A well-qualified, board-certified sleep specialist will be able to assess your health, review your sleep study and select the optimal therapy to improve your condition. Sullivan CE, Berthon-Jones M, Issa FG, Eves L. “Reversal of obstructive sleep apnoea by continuous positive airway pressure applied through the nares.” Lancet 1981, 862-865.